Need a recipe for chicken fingers? 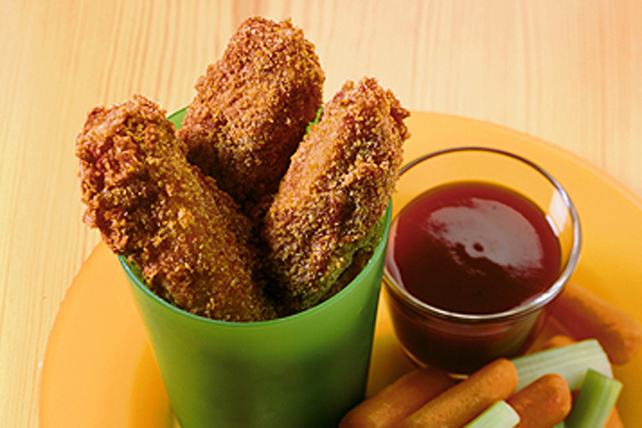 Then try our easy recipe for Chicken Fingers. Kids of all ages will love this tasty recipe - guaranteed! Mix chili sauce and tomato paste in pie plate until blended. Combine cornflake crumbs and cheese in separate pie plate. Spray baking sheet with cooking spray. Dip chicken, 1 strip at a time, in chili sauce mixture, then crumb mixture, turning to evenly coat chicken with each ingredient. Place on prepared baking sheet. Bake 15 min. or until done, turning after 8 min. Serve with barbecue sauce. Serve with Renée's Sesame Ginger Teriyaki Sauce and fresh vegetable dippers.